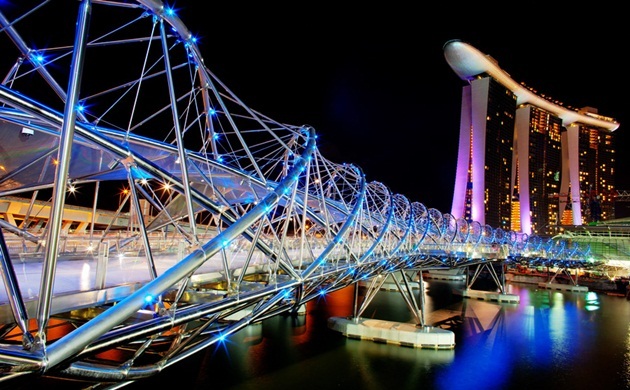 This bridge in Marina Bay is the world’s first curved “Double Helix” pedestrian bridge. It comprises two opposite spiraling steel members that are held together by a series of connecting struts to form a tubular structure. This provides an inherent strength, ideal for the curved form. Its resemblance to the structure of DNA, the basic building block of life, symbolises “life and continuity”, “renewal”, “everlasting abundance” and “growth”, reflecting similar aspirations for Marina Bay. The Helix Bridge, previously known as the Double Helix Bridge, is a pedestrian bridge linking Marina Centre with Marina South in the Marina Bay area in Singapore. It was officially opened in April of 2010 and completes an entire walkway around Marina Bay. Canopies (made of fritted-glass and perforated steel mesh) are incorporated along parts of the inner spiral to provide shade for pedestrians. The bridge has four viewing platforms sited at strategic locations which provide stunning views of the Singapore skyline and events taking place within Marina Bay. At night, the bridge is illuminated by a series of lights that highlight the double-helix structure, thereby creating a special visual experience for visitors. It was also essential that the architectural lighting features should emphasize the bridge’s various shapes and curves. Towards that end, a series of dynamic multi-coloured light-emitting diode (LED) lights are installed on the helix structures. Outward-facing lights accentuate the sweeping structural curves, with another discreet array of lights illuminating the internal canopy of glass and steel mesh to create a dynamic membrane of light. The inner helix uses white light to illuminate a path for pedestrians. Pairs of coloured letters c and g, as well as a and t on the bridge which are lit up at night in red and green represent cytosine, guanine, adenine and thymine, the four bases of DNA. The intentional left handed DNA-like design, which is the opposite of normal DNA on earth, earned it a place in The Left Handed DNA Hall of Fame in 2010 . Click here for a 360 degree view of Helix Bridge. This entry was posted in Architecture and tagged General Information by Roberta Estes. Bookmark the permalink. Hi do you know what the DNA sequence is given on the bridge and what it codes for? What organism is it found in?